In the context of the discourse on ‘new wars’, in which economic motives and agendas are of major importance, increasing attention is being focused on the role of the private business sector in contemporary violent conflicts and wars. Private business can contribute both to the outbreak of violent conflict and to the prolongation of war, be it because private business provides the revenues for the fighting parties or because business interests are directly linked to upholding violent conflict. Access to and exploitation of natural resources such as diamonds, gold, copper, oil and tropical timber are particularly conflict-relevant issues; hence some observers even speak of ‘resource wars’ as a new type of conflict. On the other hand researchers, politicians and civil society organizations contend that the private business sector has to be included in efforts towards crisis prevention, conflict management, termination of conflict and post-conflict peacebuilding. Private business can enhance the respective endeavors of states, international organizations and civil society. Corporate social responsibility has to address issues of conflict prevention, non-violent conduct of conflict, and the stabilization of peaceful and just societies. 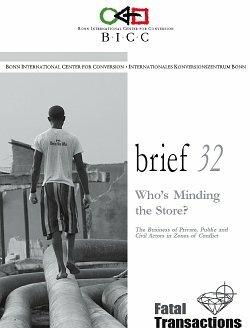 BICC brief 32 gives an overview of both dimensions of the business and conflict linkage. First it elaborates on the various ways in which private business is involved in violent conflict. In a second step, a number of approaches are presented that aim at containing the conflict potential inherent in private business activities and at the inclusion of the private business sector in conflict prevention and peacebuilding.